Finally creating in San Francisco, California!! Been waiting to get there my entire life! I will be joining forces again with JFeather from Art Kills Artists for “THREAD SHOW” on Sunday, November 20, 2011 in San Francisco, Ca. We will be pumping out a LIVE Mural while the fellas from FFBB exhibit works and spread the word and sling the clothing line. THREAD SHOW will be taking place at the Metreon Shopping Center on 101 4th street San Francisco, Ca. 94103. All info and links below, see you there! 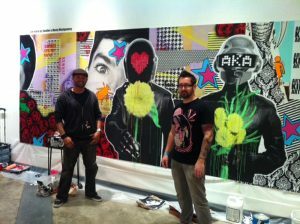 Check the last mural below thatwe did at THREAD in San Diego last month!